Washington, DC really does have some amazing places to visit with kids. My daughter and I were reminded of that this week when we visited the Butterfly Pavilion at the Smithsonian’s Museum of Natural History. On the second floor of the museum is a butterfly exhibit and for a small fee (adults $6 and kids $5) you can walk through a butterfly pavilion. The pavilion looks like a giant bubble and is about 10 yards long. 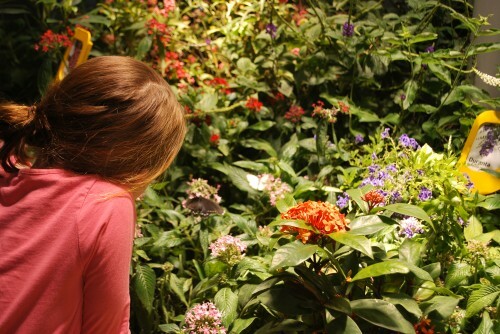 In it is a tropical garden filled with dozens of varieties of butterflies. You will see them flying everywhere, but you are also able to get a good look at them as they stop to taste a flower or fruit that has been left out for them. I was lucky and made a friend who I carried around on my shoulder the entire time I was in the pavilion. As you leave there are huge mirrors so you can check to make sure no butterflies are hitching a ride and trying to make a break for it. 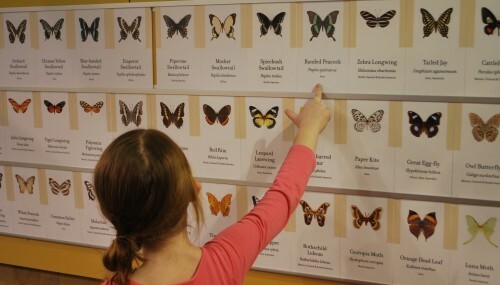 After walking through the butterfly exhibit we explored the insect exhibit. Butterflies or insects, one will surely interest your child. 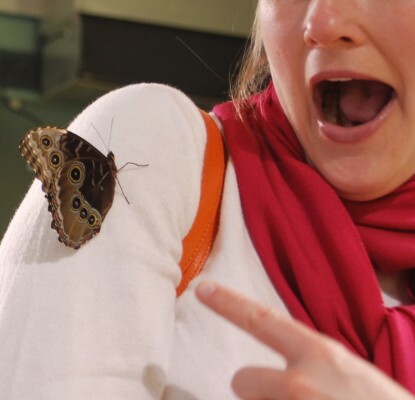 We were “lucky” enough to run into a Smithsonian scientist who had some bugs you could hold. 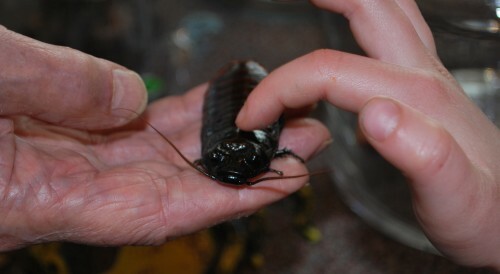 Now I am from South Carolina and I’m used to large cockroaches, but I had never seen a cockroach this big. Yuck! It was a really fun afternoon. We had visited the museum before, but these exhibits were new for both of us. That’s the great thing about the Smithsonian museums, they are free so you don’t feel as if you have to conquer the entire museum in one visit. 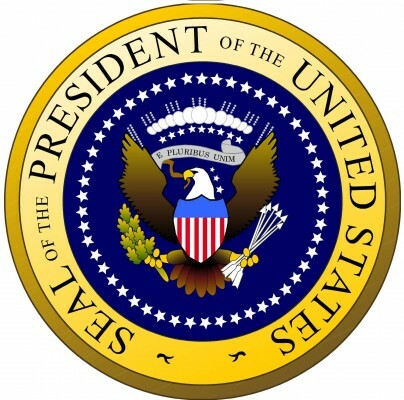 Want to learn about the U.S. Presidents? Are your kids full of questions about being President after watching the Inauguration this Monday? The Smithsonian’s National Museum of American History is a great place to learn about the U.S. Presidency and see all of the dresses the First Ladies wore to the inaugural balls. The National Portrait Gallery is also a good place to visit. There you will see the official portraits of all of the U.S. Presidents. The Presidential exhibit at the museum, “The American Presidency: A Glorious Burden,” will give your child a view into the lives of the 43 U.S. Presidents. Through over 900 artifacts, such as letters to the President written by children, political cartoons and old news reels, you will learn about the most powerful job in the world. 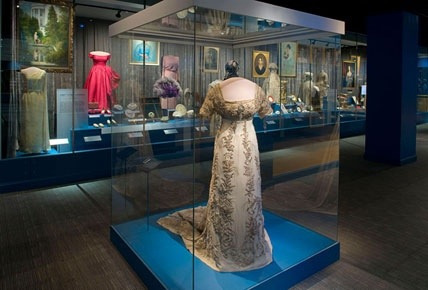 The First Ladies exhibit not only features the beautiful dresses worn by the first ladies to the inaugural balls, but also offers a history of the important role first ladies have played in our nation’s history as advocate, campaigner and official hostess. You won’t see the red dress Michelle Obama wore to the Inaugural Ball on Monday as the museum only collects the dress from the first Inauguration, but you will see the white and silver dress she wore four years ago. 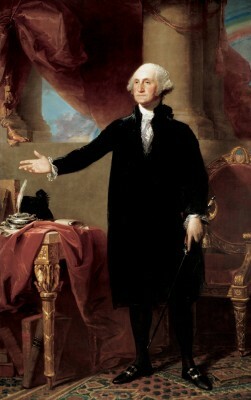 The National Portrait Gallery has a complete collection of portraits of all 43 U.S. Presidents. This permanent exhibit is located on the 2nd floor. It is so interesting to see the different styles of the portraits and how those reflect the individual’s personality. See how many President’s you and your child recognize and start a discussion about the important role each man played in our nation’s history. Location: This museum is part of the Smithsonian, but is not located on the National Mall. It is just a few blocks away though at 8th and F streets, NW. Our city is alive with history and if you’re lucky your child will learn something without even realizing it! 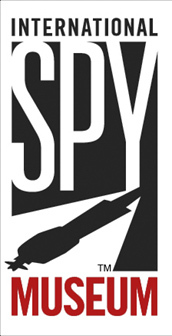 More often than not the Spy Museum is mentioned in a list of things to do in Washington, DC. I headed off on a spy adventure this weekend with my 6 year old daughter and her friend to check it out. Now let me preface this post by mentioning that my daughter’s favorite movie is Spy Kids 4 and she dressed as an “OSS” spy for halloween this past year. Needless to say this is a trip she has been looking forward to. I should also mention this was our second attempt to visit. The first time we planned to visit was during the Christmas break. I called ahead and discovered there was an hour long wait outside to get into the museum. We decided to abort the mission and try again another day. Luckily when we showed up on Sunday there was no line at all, literally. So first tip is do not go on a holiday weekend and better yet call ahead to gauge the wait time. 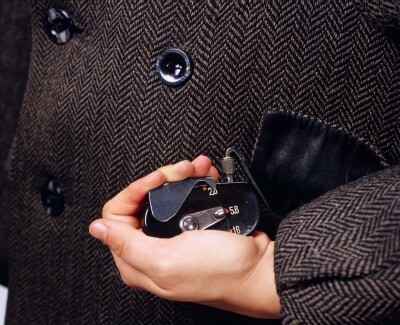 The second thing to mention is that in a city of free museums the Spy Museum is quite pricey by comparison. Adult tickets are $19.95 and children ages 7-11 are $14.95. Luckily for me, children 6 and under are free. The museum’s permanent exhibit is housed on one level of the building and they pack a lot in. There are lots of interactive stations where kids can put on headphones and listen to secret recordings or try to find the suspicious characters in a photo. 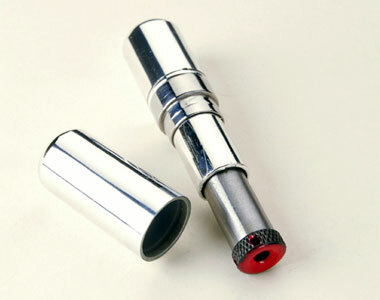 My girls favorite displays were the camera in the trench coat and the gun hidden in the lipstick. 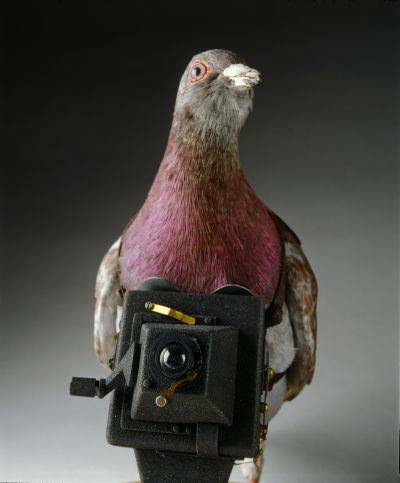 My favorite were the sunglasses that were actually a videocamera and the exhibit on the camera carrying pigeons used in WWI. The exhibits are certainly historic, i.e this is not high tech spy equipment you will see, but I guess that makes sense as we don’t want to give away our current secrets. There is a lot of reading in this museum. We went through the permanent exhibit and the special James Bond villians exhibit in an hour, but the girls were basically running from thing to thing. If you have a child who is a good reader and really into spy or war history then you could easily spend two hours in the museum. Post visit and over gelato at the neighboring Pitango (favorite), I asked the girls if they would recommend the museum to friends who were visiting DC. Both girls said they would and my husband got a full recap of the highlights over dinner that night. Sounds like a ringing endorsement to me. Location: The museum is located in Penn Quarter – one of my favorite family spots in DC, great restaurants and walking distance to the Smithsonian. The museum address is 800 F Street, NW, between 8th and 9th Street. Metro: The museum is within walking distance of the Gallery Place/Chinatown metro stop. Hours: Check the museum website for hours because they vary depending on the events going on in the city and how busy the museum plans to be. The best day to visit is a weekday when the crowds aren’t as large. Tickets: It is advised to buy tickets ahead of time – especially during the summer or weekends. Buying tickets beforehand doesn’t mean you can walk right in. When you arrive you may find both a ticket holders line and a line to purchase tickets. Visit the museum website to purchase advance tickets. Tickets for adults are $19.95, childen 7-11 are $14.95 amd children 6 and under are free. Strollers are not allowed and will have to be checked in the coat room so bring that baby carrier.